This is how they came out cracked out of the shell, perfect for a nice piece of toast right! ... anyway I carefully separated the white from the yolk (only one casualty from 6 eggs), dusted in flour, dredged in a beaten egg, then coated in bread crumbs and fried in oil at 180°C for about 30 - 40 seconds. A little fiddly but actually quite easy... and very delicious! Ive seen a cheap temp controller incl probe and solidstate relay on trademe for around $130. You could use it to control a crockpot or something similar to do the same thing. Is +/- 1-2 going to be accurate enough for this? - Install a small pump or underwater fan of sorts to move the water around. This is probably one of the biggest improvements you can make as it prevents hot and cold spots. - Elevate whatever you are cooking off the base of the crockpot (cooling rack type thing) as this is where the heat is coming from. ... and as long as you get repeatable results it doesn't matter if your thermometer is "accurate" or not, and you can use the eggs themselves to calibrate it. 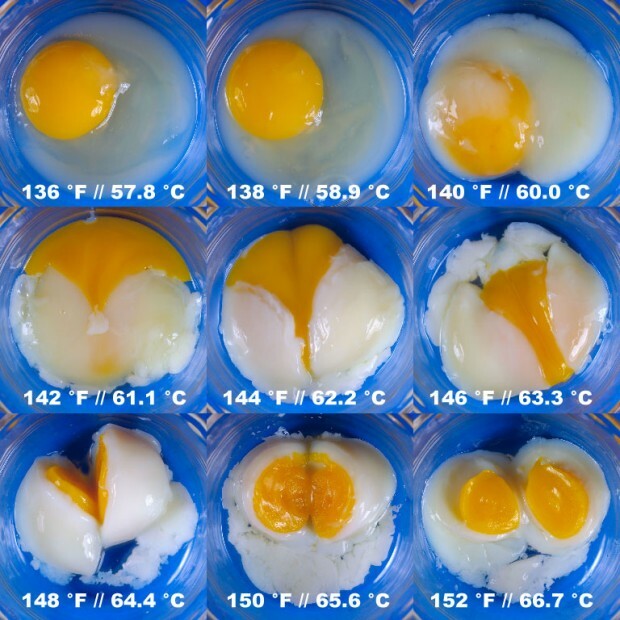 For eample if your temperature is set to 63°C and you are constantly getting egg that look more like they are 61°C from the pic above then you could safely assume that your thermometer is out by +2°C so if you want a 63°C egg you'd set it to 65°C. My guess is it'd fine It'd be amazing for meat which is where this thing really shines. Large differences between the eggs for small temp changes! The controller I've seen claims accuracy of 0.1c, not that I think it would achieve that though. I would be using it for meat anyway, might build one next week or something. You should definitely give it a crack and I'd be interested in seeing some pics of that There's no doubts you'll get some awesome results from it. EDIT: one other thing: I wouldn't bother with a vacuum packer, after paying for mine I do all my cooking in glad zip lock bags! Will use a crock pot to test it with and see how it goes, will add a small pump for water circulation. Kind of keen to get the big machine when I'm moneybags, although it'll probably end up being more of a show piece and not worth using til I have the space to host large dinner parties. It's free and was created by some of the team from the Modernist Cuisine cookbook. 36 hours at 60°C, then chilled, sliced and fried. It was a test run for a meal later this week for guests. This may be the greatest thing that has come out of the sous vide so far! The texture is very different to traditional slow roast. Not better or worse, just different. Its very soft and falls apart easily. How'd you finish the pork belly? Fry, grill, or blowtorch? Last sous vide I did was pork belly, finished on an ultra hot charcoal bbq (pre-auckland fire ban *sigh*) and was EPIC. So if one wanted to try this, what sort of cost would one be expecting to get set up, and where would one procure the equipment? Depends if you take the High (cost) road or the Low (cost) road. If you wanna take the low road you can get your DIY on. You will need to invest in a PPID temperature controller and a bunch of other electronics I don't understand. You can set up a rig for somewhere between $100 - $200 I believe. A guy here had a crack at it a while ago with good results. If you wanna just give it a try with some thick steaks or a nice piece of fish then you can have a crack at it with a beer cooler, or a pot on the stove, or even your kitchen sink. Although you won't be able to do day long cooks with this method. Thoughts on this one since it's a fair whack cheaper and less bulky? It doesn't circulate but I suspect that's not a deal breaker on a long cook, convection should work fine. And it's less accurate in holding the temp, +/- 1 degree C. For less than half the price I suspect I can deal with that. ^ as far as I can work out it's 120V AC 60Hz 550W, so you're going to need a fairly hefty step-down transformer. If you change the payment currency to UK pounds, it has exactly the same model number but lists the power supply as 240V, so i've flicked them an email asking if the power supply is dual voltage. Also worth checking out is the Nomiku immersion circulator. Heard good things about that, and it's well priced. ... and if you just search the forums HERE you'll find a bunch of people asking what the best setup for $XYZ. I'm having difficulty working out why they're all so expensive. Fundamentally they're just a heating element with a precise thermometer, a control set and a propeller... Nothing particularly complicated there. I think it has something to do with having a precise thermometer and a heating system that can keep it at that exact temperature. Either that or they are just gouging people who want to try the system themselves. I agree for the most part but when you pick up a polyscience unit you might think differently. They are heavy and extremely well built. Parts are well made and have an engineered / machined feel to them. Its freakin quiet too, it pumps a fairly high volume and is almost dead quiet. Just one of those things really where it might be worth every penny to one person and a total waste of money to someone else. It's a bit like a Big Green Egg, at first you think "you're charging how much for a big ceramic pot?!!!!" ... But then once you see one, have a go with one, and realise just how they are built it's a totally different story.